Sold by AtlanticBookStores and Fulfilled by Amazon. Gift-wrap available. Comment: ATTENTION!!! PLEASE READ!!! All our books are listed as Acceptable. Condition varies. Some books might be Ex-Library Books, may have the usual library jacket, stickers, stamps, writing and card holder. Some might have a name or gift note written in or on the book. Some books might have some noticeable wear, highlighting, writing or underlining. Access codes or CDs may or may not be included. Some books may have stickers on the outside or inside covers. Some books might be missing the dust jacket or could be in rough shape. Some may have minor water damage, creases or the memory of dog-eared pages. Please remember these are USED books. ALL books are readable from front to back. Ships direct from amazon. Sold by AtlanticBookStores and ships from Amazon Fulfillment. Start reading The Smartest Places on Earth on your Kindle in under a minute. 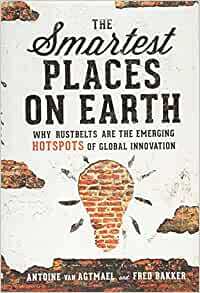 The Smartest Places on Earth: Why Rustbelts are the Emerging HOTSPOTS of Global Innovation BY Antoine van Agtmael and Fred Bakker, a book that everyone in business today should pick up and read. This is by far the most optimistic book of the year because it talks about the future, the real future not the made up future that we are hearing about from our politicians these days. This is book is talking about the future of the world not just this country and not a future that is just another rosy-glassed pipe dream but rather a future that is going on right now in the present. The authors talk about how once downtrodden has been communities are raising themselves up from the ashes and debris of defeat to the success they are experiencing today. The book tells stories of collaboration of how people of all cultures and backgrounds are coming together in certain parts of the world to make things happen. If you think building wall is the right thing to do then read this book and get out of your xenophobic funk, if you think that all countries should be operating in nationalistic creative limiting silos then you need to read this book. If you think that our world is based on every man or woman for himself or herself you need to read this book. Right from the get go in the first chapter the authors talk about “Brain belts” replacing “Rustbelts” and it happening because smart people, remember smart people and how we use to like them instead of calling them “elites” are coming together in collaborative coalitions to do great and innovative things. • Dayton, Ohio is now the center of world leadership for the innovation for the Aerospace industry developing new materials and sensors through the collaboration of The University of Dayton, and the National Air & Aviation Intelligence Center-Kettering. • Rochester, New York is now one of the world’s centers for Photonics. • Buffalo and Albany, New York working with SUNY is a center working on research for developing super batteries and clean energy. • Detroit, Michigan is not becoming a world leader in robotics as well as automotive. • Rochester, Minnesota is a center for all Life sciences not only electronics but organics as well. • Albany, New York is a world center for Semi-conductors by working with SUNY as well with scientists from all over the world they are developing and creating the world’s largest semi-conductors. That’s right Albany, New York not Milpitas, California. And many more from Austin, Texas to Raleigh, North Carolina and from Akron, Ohio to Boston, Massachusetts and from Portland, Oregon to Ann Arbor, Michigan people and institutions are coming together, working together and doing great things together, things that none of them could do alone. And these are not just Americans, these are scientists from all over the world coming together and creating these “Brain belts” that are changing everything we do and changing it for the better. Companies, Universities, Banks and investors and inventors are coming together in a true spirit of collaboration and cooperation to develop products of the future, products that are going to take us into a future we once could only dream about. Lest we forget this is a global effort with the same sort of “Brain belts” being developed in The Netherlands: Semiconductors, Finland: Medical instrumentation, Germany: Automotives and Robotics, and The United Kingdom: Bioscience. And the best thing by far is that all of these people in these Brain Belts are working with each other, sharing information in the hopes of finding global solutions to global problems. To all of these groups there are no walls there are no knowledge inhibitors at all in fact in many cases there are not even any patents, these groups are openly sharing their ideas and innovations with the common goal of making the world a better place. If I may add my two cents just the very fact that these people are on this journey and in this way is already making the world a better place. Read this and see our new world order in a much better light than you will by watching the upcoming political conventions. I heard Antoine on NPR, ordered the book and read it cover to cover in two days. I happen to live in a rustbelt city that has a research university and is beginning a comeback, but is in the early stages. The key message in this book that my city needs is the "brainsharing" aspect. I've since purchased 15 additional copies and am distributing them to stakeholders in my community as "food for thought." There is one aspect that needs more coverage in re-inventing cities, that is the importance of welcoming immigrants. Welcoming immigrants and quickly integrating them into the community can be a game changer. A key component to that is getting them into jobs that are commensurate with their education and experience in their countries of original, met with a non-profit yesterday called Upwardly Global that is doing a great job of doing just that. I have followed Antoine van Agtmael for 20 years as one of the leading emerging market portfolio managers and his insights on the future of former Rust Belts based on 21st Century technologies was spot-on. This book is a HUGE read for anyone interested in the future of US manufacturing. A must read for the economist. Interesting book that highlights the economic revival of some Rustbelt cities into Brainbelt cities. Do not necessary agree with all places included, particularly Batesville, Mississippi, but overall it is a useful and interesting read. Also would have preferred more thorough discussion on truly Rustbelt cities - Raleigh-Durham is not one, but the summaries of Akron, Albany, Dresden, Eindhoven, and Malmo-Lund which have successfully made the transition, were fascinating and inspiring. A must read for anyone interested in economic progress.